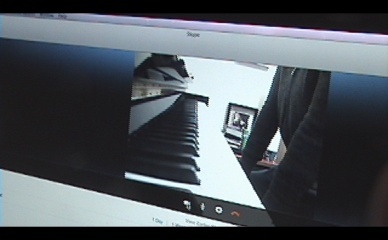 I’m not about to pitch web-cam driven piano instruction like a CD package promoter of Piano Playing in a Flash. Learning piano is not in the espresso lane. It takes time, patience, and practice. The question is, can a student gain as much from Online piano study vs. “live” in-person lessons. My beloved NYC teacher Lillian Freundlich was my role model. She always sat beside me to monitor tensions that crept into my movements. Quite often she checked my elbows and wrists until I could experience my own sense of physical freedom and Oneness with the piano. Frequently, she sang over my playing in a mother-loving musical transfer that helped me shape phrases. When I grew up to become a piano teacher, I carried on her legacy, hovering over my students, singing, conducting, and sometimes squeezing myself onto a tight-fitting bench to demonstrate a line or two. Any other form of mentoring was culture alien. It was like a hurricane it, when I sprang upon a You Tube of concert pianist, Jeffrey Biegel teaching a young adult student in Singapore. While thousands of miles separated the two, meaningful instruction transpired. Right before my eyes, in less than 30 minutes, the pupil’s phrasing had improved. I was inspired enough to try out the Millennium piano teaching landscape, having an open mind. One of my earliest Skyped lessons was transmitted to an adult student whom I’d taught “live” in El Cerrito, California. Since she would be missing a few sessions due to business obligations, a convenient make-up schedule was needed. The Online route seemed like an easy option. 1) I can strategically place my Logitech external webcam so it provides an up-close-and-personal keyboard view of my arms, hands and wrists. This camera placement allows me to demonstrate various phrases for the student. Likewise, the student can angle her camera for an optimal view of her hands if she has good equipment. 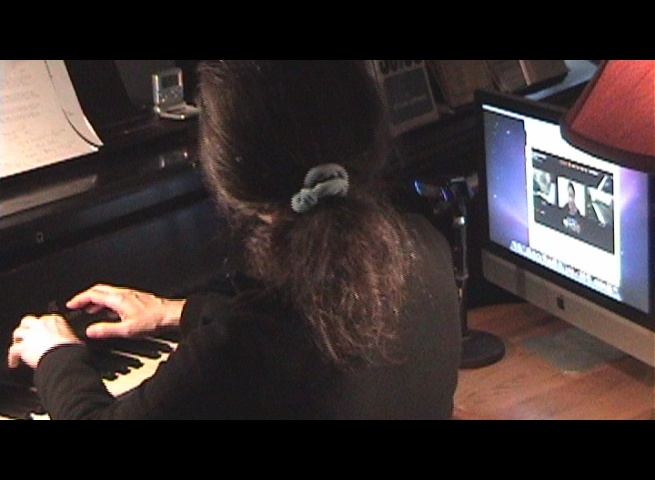 Some students rely on the computer’s internal camera which can work if the lap top is moved close enough to their instrument. When I think about it, this big screen enhancement of our piano-related physiology, provides a minute-to-minute flow of music and ideas that doesn’t require my nudging a student off the bench for a demonstration. With pupils I had coached from my second piano (a Steinway upright) the distance would be larger than by computer channels, though I could still walk over to the student if she were present. 3) Online instruction affords flexibility in setting lesson times. For students wanting to sandwich in a lesson over a lunch break or on weekends, even Sundays, it’s mouse click away. No travel, no hassle. In cities where access to private instruction is limited, web-caming provides an otherwise unavailable learning opportunity. In rural areas of the US, the same access can be provided through Online instruction. While on certain days or times, a complete lesson may flow smoothly without electronic impediment, there will more than likely be periods when both parties will have to sign off, and re-sign on to establish a better connection. After a while, this is something both student and teacher accept as part of the current landscape, though improvements in technology are in progress. 3) The etiquette of Skyping or web-caming is that the teacher and student speak or play separately. This requires mutual patience. 4) Singing over a playing is not advised, since it poses the same overlay of complications, though I can’t seem to stop my spontaneous vocalizing Online or offline. I find it advantageous to send videos to my Online private students during the week, (at no extra charge) that review the assignment and highlight practicing goals. These run about 15 minutes and are transmitted as UNLISTED or PRIVATE You Tubes. In a few cases, pupils have sent me video updates of their practicing to which I shoot back a responsive one, or provide a written critique of what has improved and/or needs more focus. Video sharing is enormously helpful and seems indispensable to Online instruction. Theory instruction can also be a valued adjunct to private lessons. It can be scheduled mid-week, or at the end of the month to enrich piano study. This is a relatively a new universe of piano teaching. POWHOW features piano lesson sign-ups in a class or private one-to-one setting. Currently I teach a tone production class that had its maiden voyage a few months ago. On both sides there are mute buttons, and one that permits a student not to be seen by other class members. Otherwise with individual piano students, there’s only one box to keep track of. I haven’t mentioned my experiences Skyping private lessons to children. This is an area where the verdict is not yet in. My inclination is NOT to teach raw beginners Online. 5 to 10-year olds need close monitoring and the physical presence of a teacher at the inception of learning. The right chemistry and the quality of a personal/musical relationship with a youngster are paramount to the success of lessons. In addition, duet playing which is a valuable teaching and ear-training activity in the early years, especially, is not feasible with current technology. Older children, perhaps, who are at Intermediate or Advanced levels, with good attention spans, would be better candidates for Skyped instruction. One parent in Oregon hired me to teach his 8-year old, and while these web-cam lessons were productive, it was my decision to ultimately refer her to a private teacher in her area. Here is one of our SKYPED lessons. 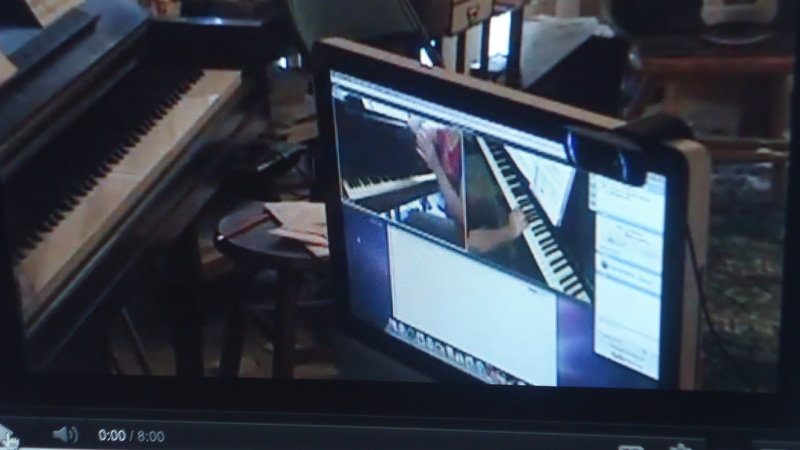 In this case, we had set up a video exchange for easy back and forth musical sharing. When all is said and done, Online piano lessons are the wave of the future. Just as cell phones have replaced land lines, taking private and group lessons over the Internet, with improved transmission in the offing, will be considered second nature.